A writer named Luis A. Ferrao has caught my attention. Back in 1990, he published Pedro Albizu Campos y el Nacionalismo Puertorriqueño (Editorial Cultural, PR). 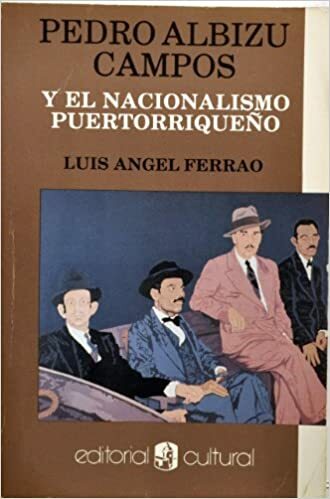 The book repeatedly claimed that Don Pedro was a fascist who wanted to emulate Mussolini in Puerto Rico, and that the Nationalist Party was an authoritarian, right-wing, fascist organization. The book’s reception was tepid. But the book has a much more select audience. Originally written in Mexico as his Ph.D. thesis, Ferrao’s thesis adviser (Jose Luis Gonzalez) hated Don Pedro…so “Albizu the fascist” was born. After publication in 1990, the Puerto Rican government rewarded Ferrao with a two-year sabbatical in Paris. Ferrao defecated on Don Pedro’s grave, for a few dollars and a trip to Paris. He is trying to do it again, with War Against All Puerto Ricans. The pattern and modus operandi are the same: a quick and dirty hit, then run and get your reward. However, Ferrao made one fatal mistake. When he abused Albizu in 1990, El Maestro was dead. Further editorials will follow this one, with specific refutation of his 29 lies – and with further analysis of his academic career, in relation to Puerto Rico. Importante situarse en el periodo historico. Los nacionalistas arabes tambien fueron facistas. Si ser facista es buscar ayuda en contra del enemigo comun. De esa forma, Los estados unidos se aliaron con la rusia de stalin y tambien por eso eran comunistas. Por cierto los padres del ELA fueron Stalin y Albizu, no Munoz y su camarilla. Thank you, Angel. I really appreciate your encouragement and support. Gracias por compartir nuestra historia. I see from WorldCat (the online catalog we librarians use to tell things like which other libraries have a book) that the Ferrao book is held by at least 76 other libraries (not mine I am happy to say). Having said, many libraries here in the U.S., unless they have strong PR studies program or at least strong Latin American history programs, may have very little on Puerto Rico (I am in a small liberal arts college in KY, and Mr. Nelson’s book is the most recent thing on PR we now have, and that is because I ordered it. Otherwise, the holdings here on PR are woefully antiquated, and this is just one place), so if the only thing they have is Ferrao’s poor quality work (being charitable here), then they may not be getting good information (and that assumes the book is used at all and not languishing on a shelf ready to be weeded out for lack of use). I honestly hope that poor work indeed does get weeded for lack of use in more libraries. Best of luck, Sr Nelson. Keep telling the truth and waking up more people. Best, and keep on blogging. Clemente soto velez and Juan Antonio Corretjer, are not fascist either. Great!!! Love the last sentence!!! Is he interested in a debate with you? I’ll buy tickets for that!! Open comment to Luis A. Ferrao …. “It won’t happen again. We won’t let you. We know the truth now. The facts presented in this new book (War Against All Puerto Ricans) are well researched and documented. We know better. Don Pedro and Don Nelson will be protected by us … those who know and those who believe in the truth. Do not mess with us! !” …. The truth won’t be distorted again!! The truth won’t be hidden anymore!